This workshop will introduce participants to the software package compas_fab, which facilitates the planning and execution of robotic fabrication processes. It provides interfaces to existing software libraries and tools available in the field of robotics (e.g. OMPL) and makes them accessible from within the parametric design environment. The package builds upon COMPAS, an open-source Python-based framework for collaboration and research in architecture, engineering and digital fabrication. In the workshop participants will be guided through the planning and execution process for the robotic construction of spatial structures. 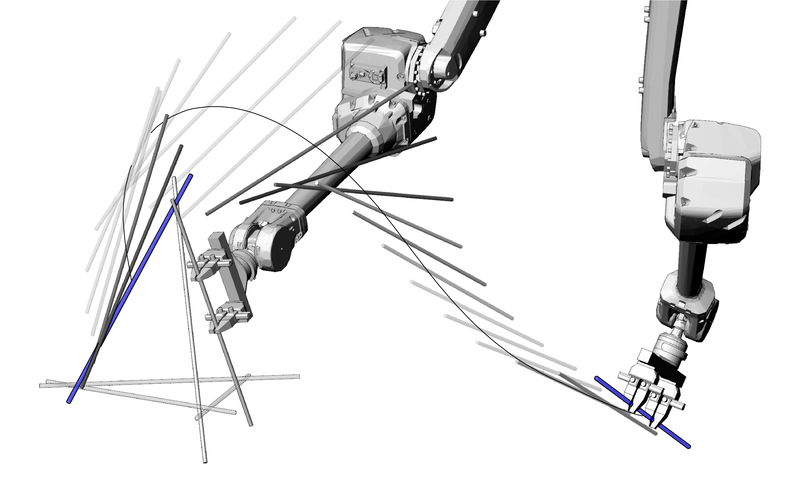 Specific focus is automated path-planning for obstacle avoidance and the control of multiple industrial robotic arms to collaboratively assemble timber elements. Participants will gain a general understanding of the underlying components involved for the robotic assembly of spatial structures as well as a basic familiarity in using the provided tools from within the Grasshopper interface.